Reston Snake Removal & Snake Control Experts provides services to such complaints as I have a snake in my house. Snake Removal operators understand that a snake in a home is an emergency and 24 hours Snake Removal Service is available. 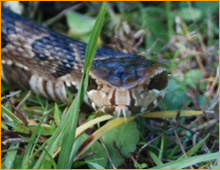 Nuisance wildlife removal operators are experts in snake removal and snake control throughout Fairfax County Virginia including Reston, Herndon, Vienna, Oakton, Ashburn, and Great Falls, Virginia Animal removal operators understand that a snake in the home is an emergency that cannot wait till the next day. Snake removal is dangerous and should only be done by a trained wildlife professional. Virginia's three most dangerous venomous snakes include the, Timber Rattlesnake, Eastern Cottonmouth, and Northern Copperhead. These dangerous snakes can cause serious injury even death. Venomous and nonvenomous are commonly found in homes, commercial, and industrial areas of Reston. If you encounter a snake you should immediately distance yourself from the snake, if possible keep visual contact on the snake, and call a snake removal expert to remove the snake from your home or business. A common reaction to a snake regardless whether it be in your home or on your property is to kill it whether or not it poses a risk or not. However, the fact is that most snakes in the local area are harmless and even the dangerous ones would rather flee than fight. Once we begin to learn about snakes, we can replace our fears and misconceptions with facts. Once understood we can then appreciate the important role snakes have on the Reston, VA. You should never attempt to kill a snake this could lead to a dangerous snake bite. Snakes are reptiles and belong to the same group of animals as lizards, turtles and crocodiles. Reptiles have dry scales that shed periodically. Unlike mammals and birds, reptiles cannot generate body heat and depend on outside sources to raise their body temperature. This trait makes them wait out long periods of extensive cold and hot conditions that we experience in the Reston areas or Virginia. Snakes differ from other reptiles by having no legs, ears, or eyelids, and by possessing only one functional lung. The most notable characteristic of a snake is its extremely long, slender body. A snake's body allows it to effortlessly climb, swim, and slip into the smallest spaces including your home and basement areas of your house. Although snakes lack ears and cannot technically hear, they do have the ability to detect low frequency vibrations from the air and ground. Instead of eyelids, snakes have a clear scale covering for each eye. The shedding of this scale causes the eye to cloud over for a few days, which led to the myth that snakes go blind during certain times of the year in Reston. Q: Can I die from a snake Bite? (A) Yes, If bitten by a venomous snake. Immediate medical attention should be obtained. An Antivenin can be administered by hospitals and emergency care centers. It is important to keep the affected snake bitten extremity below the heart. Most snake bites occur on these hands from people trying to capture snakes. Q: How do I get Rid of Snakes in my Virginia home? (A) The key to getting rid of snakes from your Reston home is sealing up all the entry points and eliminating the major food sources including but not limited to mice, spiders, crickets and other insects that inhabit your home, this should be done by a professional as you never want to seal a snake up inside your home. Q: What are some of the common venomous snakes in Reston Virginia? (A)The most common venomous snakes in Virginia are the Timber Rattlesnake, Cottonmouth, and Copperhead. Others non venomous snakes include the Black Racer, Scarlett Snake, Eastern Hog Nosed Snake, Milk Snake, Ring Necked Snake, and Scarlett Snake are among a few snake species of Virginia. Snakes are a very common call in the Reston area of Virginia. Most snakes that enter homes and garages are looking for a food source. If you have a snake in your garage or home you should contact a professional snake removal company to make recommendations to solve the problem completely. An important fact to remember simply removing the snake DOES NOT SOLVE THE PROBLEM! The snake’s food source must be removed. Some of the common things we find are: Rattlesnakes in the home, Snakes in a business, Snakes in the attic, snakes in the basement, snakes in the kitchen, snakes in the house, snakes in the walls, snakes in the ceiling, snakes in the shed, snakes in the garage, snakes in the yard, snakes in the woodpile and all other nuisance snake problems found throughout all of Fairfax County and Virginia cities including Reston, Herndon, Vienna, Oakton, Ashburn, and Great Falls, Virginia. Animal removal experts can solve any type of pest animal problem throughout Reston VA.